The entire War for the Crown Adventure Path is now available on Roll20 with the release of the final module: The Six-Legend Soul. In order to save Taldor’s Future, our heroes must confront its Past. The War for the Crown Adventure Path has been a blast so far. If you’ve been following along, you’ve seen how this puts players up close and personal in the succession of Taldor. Fighting for an empty throne, the players have either supported a candidate for the Throne, or following the events of the last installment, attempted to claim the throne for themselves. But now–now a powerful cabal of immortals stands poised to dictate power as it always has been. Can your heroes confront the Six-Legend Soul? 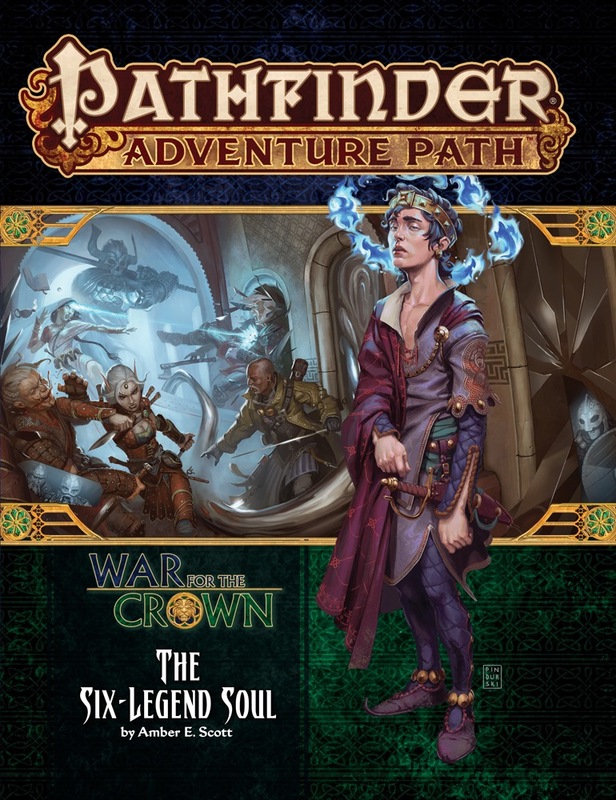 The final chapter of Paizo’s “War for the Crown” Pathfinder Adventure Path has arrived on Roll20! Finish the tale and decide the fate of a nation in The Six-Legend Soul, available now on the Roll20 Marketplace for $24.99. 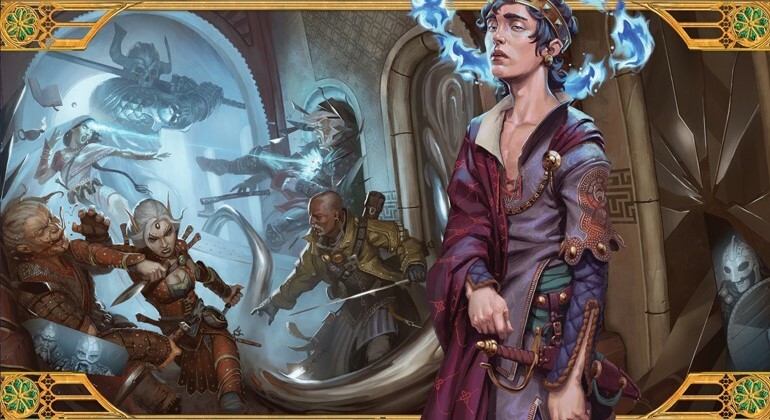 The Six-Legend Soul is the sixth and final chapter in the “War for the Crown” series, all available on Roll20 as complete conversions with dynamic lighting, one-click actions, and a wealth of other bells and whistles. If you would like to review this complete product, press review copies for all six chapters are available upon request! 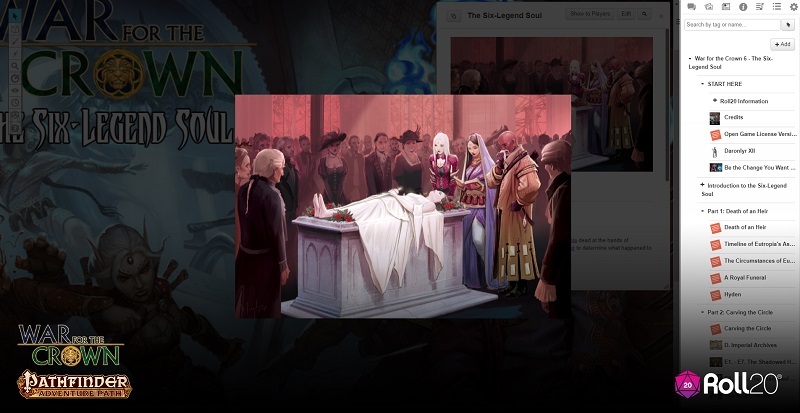 Along the full Adventure Path, players will see their allies rise and fall and new opponents emerge from the shadows until the final conflict arrives in The Six-Legend Soul ($24.99 USD), the last chapter released on Roll20 today. 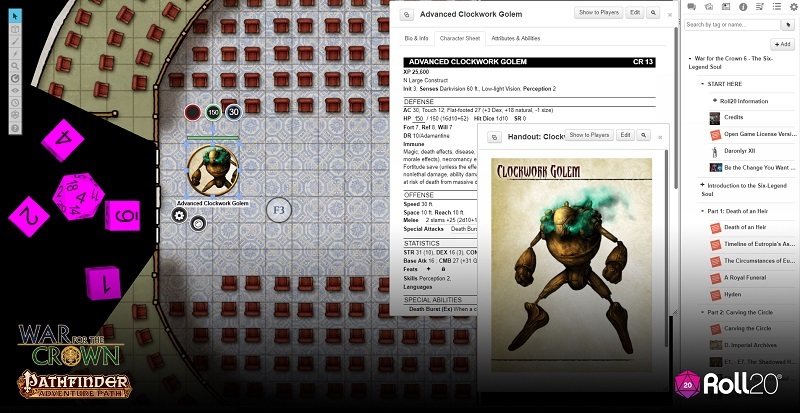 Every monster has a complete character sheet with click-to-roll actions and stands ready to battle on fully converted digital campaign maps enhanced by Roll20’s signature Dynamic Lighting and Advanced Fog of War. As the heroes return to Taldor, they discover that strange seeds have finally borne fruit—conspiracy has laid their patron low. They must now face the cunning secret society, the Immaculate Circle, and put an end to its immortal machinations, finding new enemies along their path. To finally set the world right and end the War for the Crown, the heroes must confront not one but six of Taldor’s greatest emperors, resurrected from the past! Can the heroes survive, or will Taldor’s past sins forever define its future? “The Six-Legend Soul,” a mind-bending Pathfinder RPG adventure for 16th-level characters, by Amber E. Scott. Ways to continue your campaign, including a system to determine Eutropia’s legacy based on decisions made by your heroes, by Crystal Frasier. 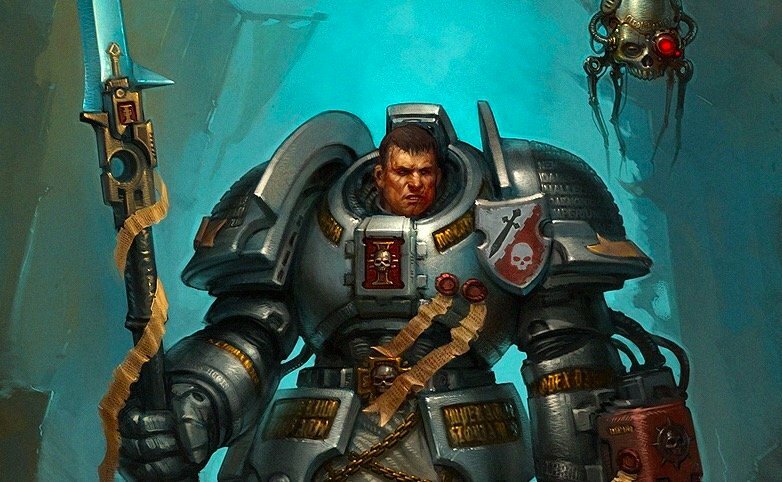 A look at six of Taldor’s most famous emperors, including the legendary spirits they provide to mediums and feats useful for any hero, by Lyz Liddell. An overview of the resolute Ulfen Guard, by Ron Lundeen. A bestiary of powerful and dangerous creatures, including the terrifying phylacator kyton and the hubris-grown bramble throne, by Kate Baker, Jay Erickson, Tom Hansen, Aerick Lim, and Nathan Reinecke.